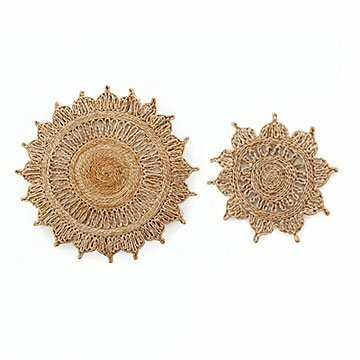 Crocheted from jute by artisans in India, the heat-resistant design is also dishwasher-safe. Flowers always brighten a table. Set down these trivets before you set down a hot meal and some bright smiles are sure to follow. Crocheted from jute by artisans in India, the heat-resistant design is also dishwasher-safe, so no worries if you drip a little pesto onto these petals. The set includes two sizes: one large (casserole, soup pot) and one small (coffee pot, sauce pot). Handmade in India. Dishwasher safe. Can also be spot cleaned and air dried. Great design. Feel good back story of creator!